Welcome To Arkansas' Favorite Candy Kitchen! 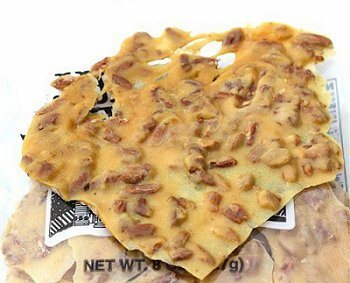 Juanita’s Nut Brittle – The pride of Arkadelphia, Juanita’s Candy Kitchen has been producing the best nut brittle in the state since 1974. Juanita’s produces three varieties of brittle—peanut, pecan, and cashew. It’s thin and shatteringly crisp, permeated by an aroma of roasted nuts and sweet caramelized sugar. If you think you don’t like brittle, try this stuff…there’s a good chance you’ll change your mind. It’s without a doubt, the best reason to hop off I-30 that I can think of. The store is located behind Wal Mart. Open Monday - Friday 8:30 a.m. to 5:00 p.m.
Juanita's peanut, pecan, and cashew brittle is exactly what you need. Enjoy our brittles yourself or send it as a gift for any occasion. Call us to place an order or print an order form to mail or fax in.